NEW YORK (AP) — Attorney General Jeff Sessions expressed confidence on Thursday that the U.S. justice system can handle terror suspects like the man charged in the deadly truck attack in lower Manhattan. 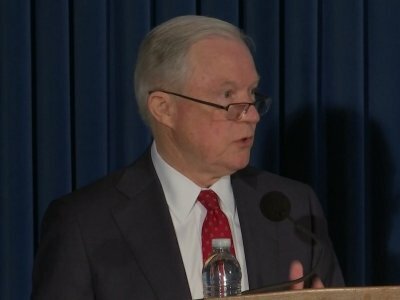 Speaking to members of law enforcement a few blocks from the scene of attack, Sessions also said Guantanamo Bay would remain in the anti-terror mix. The attorney general’s visit to New York City was scheduled before a man used a rental truck on Tuesday to kill eight people on a bike path. The suspect, Uzbek immigrant Sayfullo Saipov, was shot by a police officer and captured. Prosecutors brought federal terrorism charges against Saipov a day later, saying he had planned it for weeks. “This week’s deadly incident — the deadliest attack on New York since 9/11 — is one more reminder of the dangerous threats that we face as a nation,” he said. Sessions also defended Trump’s push for a repeal of an immigration program that allowed Saipov into the country. Trump has sought to blame Sen. Chuck Schumer for the program, prompting Schumer and other Democrats to accuse the Republican president of trying to politicize the tragedy. Saipov is charged with two terrorism-related crimes. His attorney has said it’s important to let the judicial process play out. This story has been corrected to show that the attack occurred on Tuesday, not Monday.